Double your Garden Space with Double the Benefits! Almost time to start digging in the dirt! 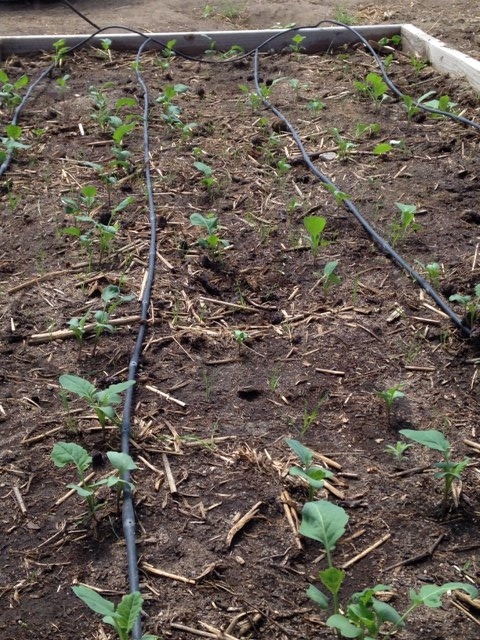 The cool season crops, like spinach, lettuce, broccoli, cauliflower, kale, peas, etc., are happy to be already planted in our zone 5. 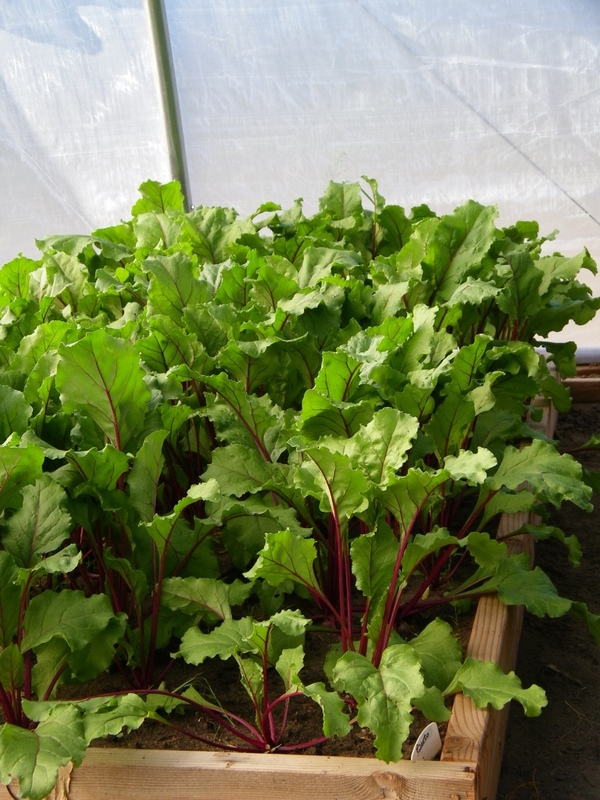 They can take the cooler soil and air temperatures. Frankly, they will soon be unhappy when the warmer days are upon us. 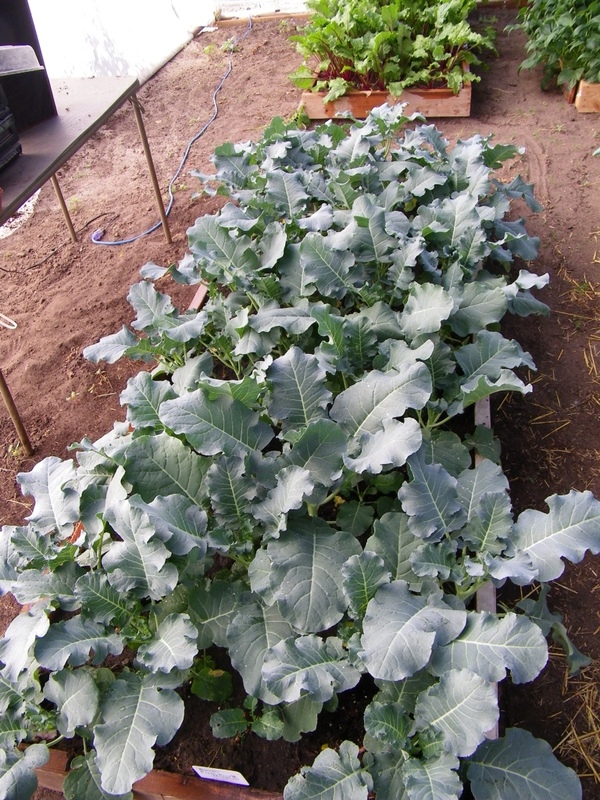 My broccoli is growing nicely in the high tunnel. Since my temperatures can get quite high in there and these cool season crops will bolt, I've installed some old hog paneling over the raised beds to accommodate my heat-loving vining crops. 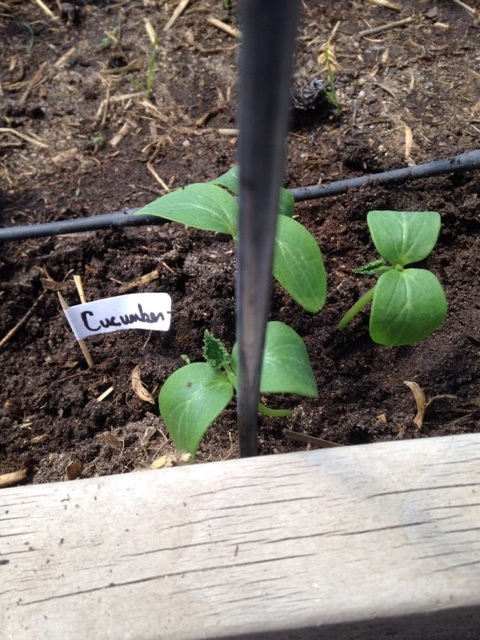 My intention here is to let my pumpkins, cucumbers, squash and melons grow up and over the cool season plants that are growing below. I've planted some vining crop seedlings that I had already started in small pots. As they grow, they will shade the stuff below – keeping them somewhat cooler – and have plenty of room to vine as they wish! I have read that the cucumbers are easy to pick as they will hang down below the openings in the hog panels. The pumpkins and melons will need a “sling” to support them – I'm sure some old pantyhose will do the trick! I'll let you know! How ’bout Planting an Extra Row? Spring is springing!! 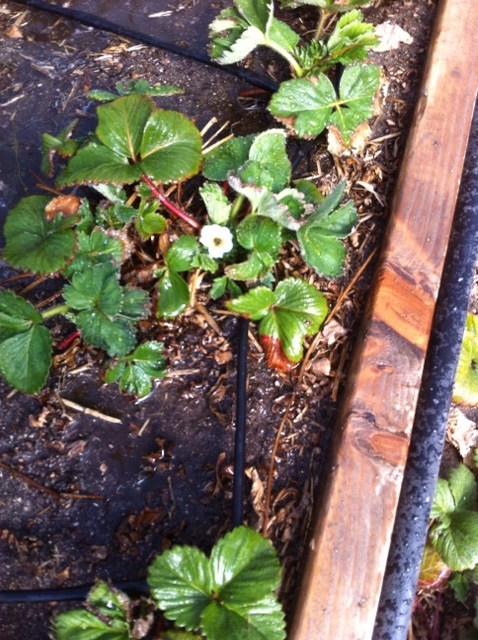 The strawberries in my high tunnel are blooming with the great promise of nummy goodness in the near future. The broccoli that we planted last fall made it through the winter and is making heads as we speak. The recently planted lettuce, spinach, beets, green onions, broccoli and radishes are peeking through the soil, the carrots and cauliflower have yet to show their faces. 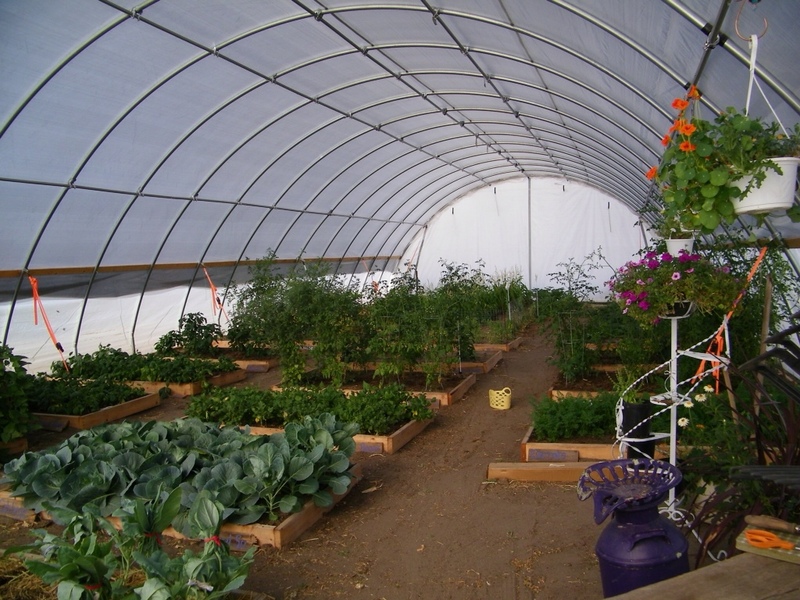 My high tunnel is reaching some crazy warm temperatures – over 120 degrees and we have just finished the month of March. 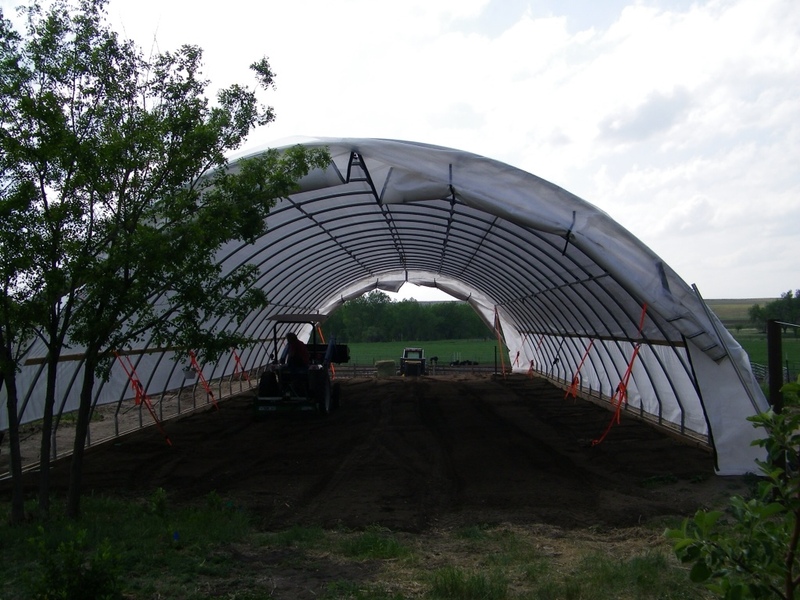 Special care has to be taken daily to roll the sides up on the structure to provide cross ventilation or the fledgling plants will wilt. We have been checking soil temperatures in our fields and outside gardening areas. Besides the soil temperatures being a concern, our farm needs to also grow the supplemental forages for our grass-fed beef. Colorado has been coming up short in the moisture department for the last couple years which seriously decreases the time the cattle can graze a pasture. We have had to rotate the cattle through the fields quickly to protect the grass from over grazing. Most of our crops withered in the field in 2012, so careful thought has been given to a great forage that we could get to maturity!!! 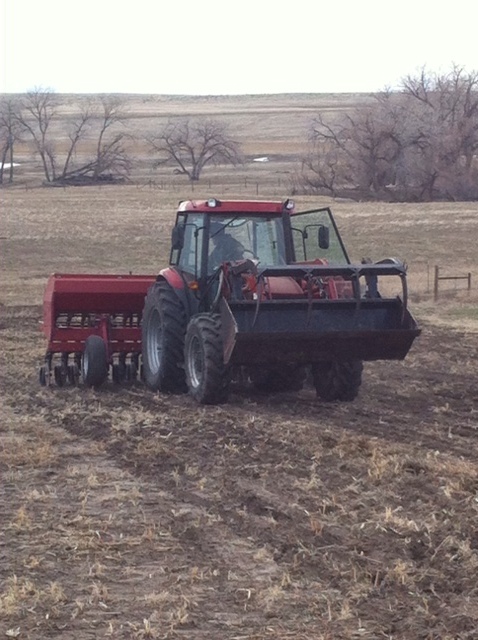 With the hope that we could take advantage of our spring moisture, we began to plant an oat/pea mixture that will germinate at 40 degree soil temperature. The weatherman says we could get some precipitation in the next couple of days – so with 53 degree soil temps, the tractor and planter went into action last night. C'mon rain! My outside raised beds have really warmed since our big snow about ten days ago. It's time to plant the onions, kale, and lettuce out there. We are going to put the onions in a block planting – every 4-6″ every direction. Onions are sensitive to photoperiod, so the earlier the planting, the larger the bulbs. 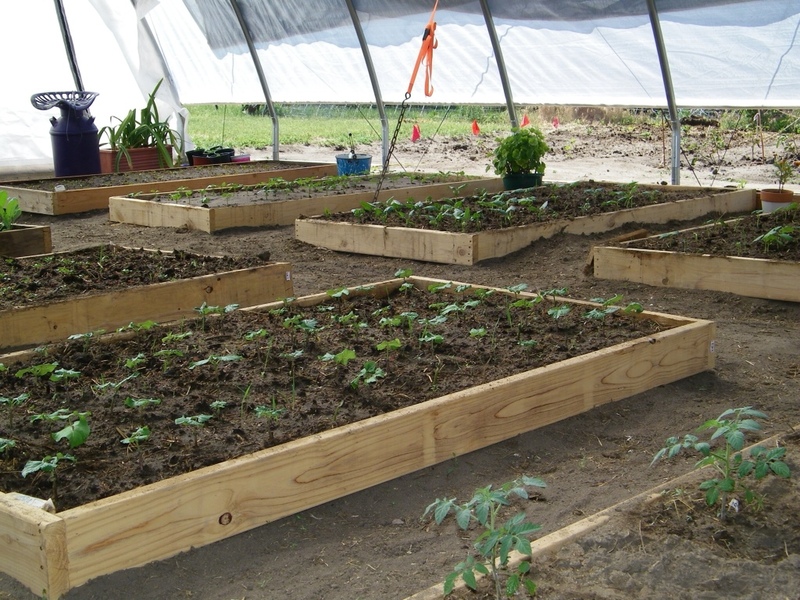 Our raised beds will provide uncompacted soil and great drainage. Gardeners across the country (even the world) have such a power to provide. A few extra seeds here and there – and with love, sunshine and water we can share our surplus with food banks. Our little town has a wonderful community outreach program. Many times, as I drop off my extra produce (course I have to look through the second-hand stuff to see if there is something I just have to have!) my fruits and veggies are already gone from the shelf. Something that seems trivial and extra to me means so much to others. There are many programs out there – Plant a Row for the Hungry supplies food banks with your farm fresh goodies. Many times food banks are only able to keep canned veggies on hand – merely because of the time it takes to store and distribute them. Produce for Pantries connects youth growing produce in school gardens, residents growing in community gardens, and citizens growing vegetables in home gardens to help nourish their neighbors in need. You can participate with a formal program or just gather your goodies and head for a local drop-off place. So when you start tucking those seeds in the ground, add just a few extra to share with the food banks. Such a simple thing can really make a difference! Spring is almost here in the Rockies! I have been diligently checking my soil temperatures in the high tunnel and the day finally arrived! My raised beds were above 40 degrees and the cold crops of vegetables can go in the ground! For the last two years I have been working on a grant through the NRCS on extending the growing season for fruits and vegetables. 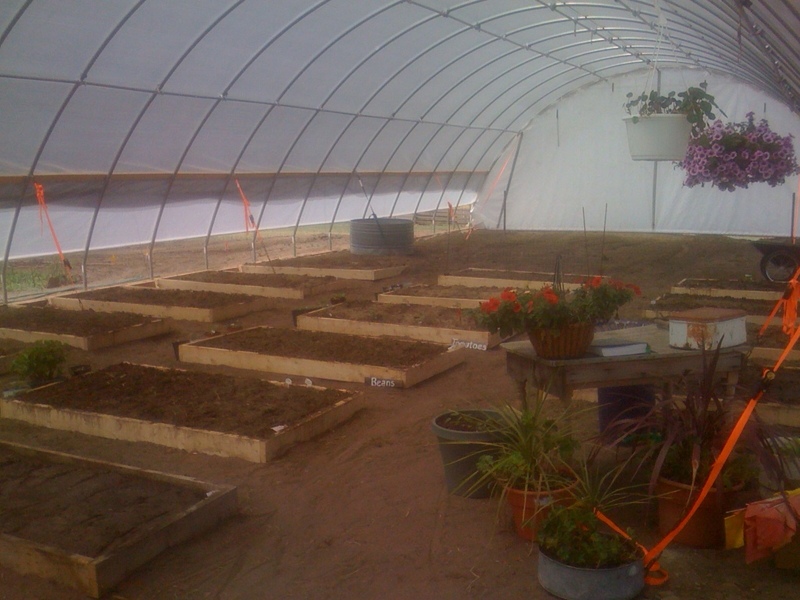 What that means is….I try to dream up any way I can think of to extend our zone 5 growing season. 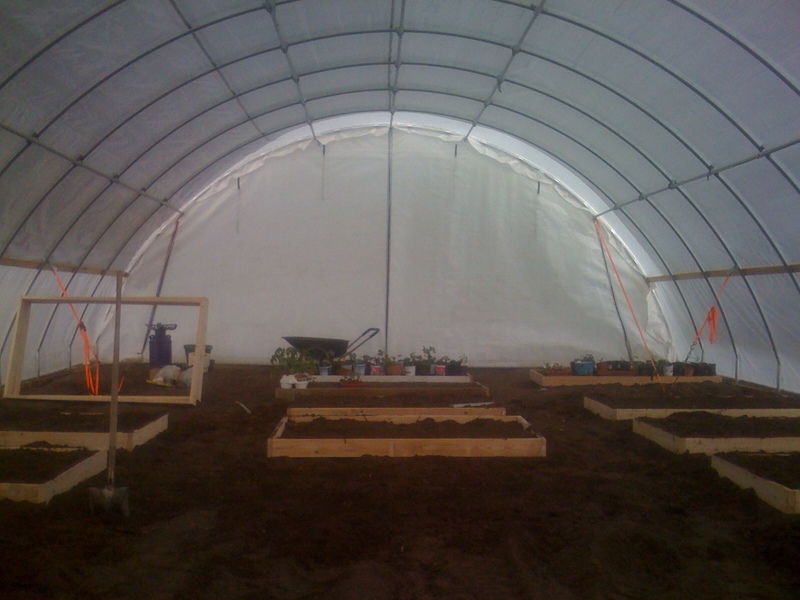 After constructing our high tunnel, one of our first order of business was to construct raised beds. These can be made of any material you wish – anything from 2 x 4s, 2 x 6s, even larger lumber like 2 x 12s. You can use cement block or bricks. Please avoid railroad ties and pressure treated lumber! They contain chemicals that could leach into your soil and get into your plants. We only want you to grow goodness in your beds. 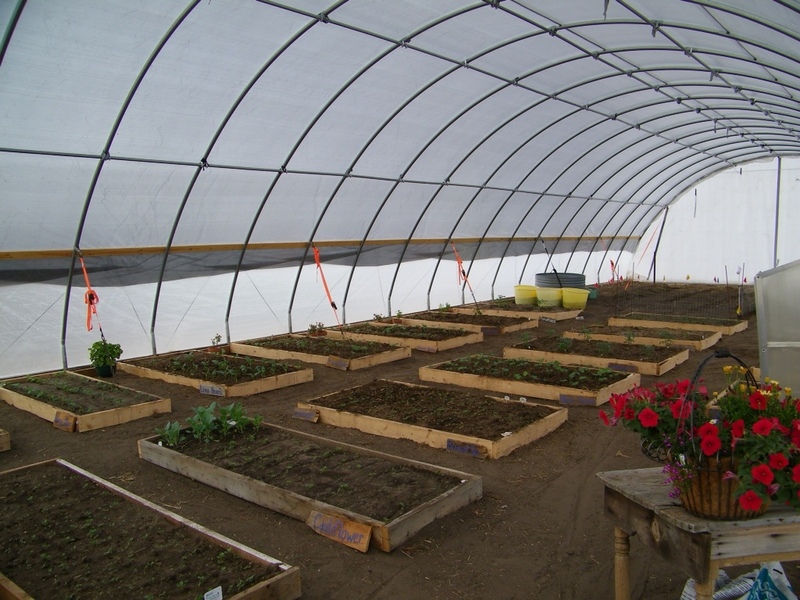 We used 2 x 6s in our high tunnel, but dug the soil within the bed down 6″ and mixed it with the organic matter and new soil we had brought in to fill our bed. You want to avoid just putting your new soil on top of the existing soil – it can seriously impede your plant roots from going down. Mix it up! Raised beds give the gardener a jump on the growing season as they dry out faster after a snow or rain, and the soil warms at a faster pace than regular ground-level soil. It is easy to check the fertility of the soil within your bed and to apply any fertilizer you may need because you know how many square feet you are dealing with within the bed itself. 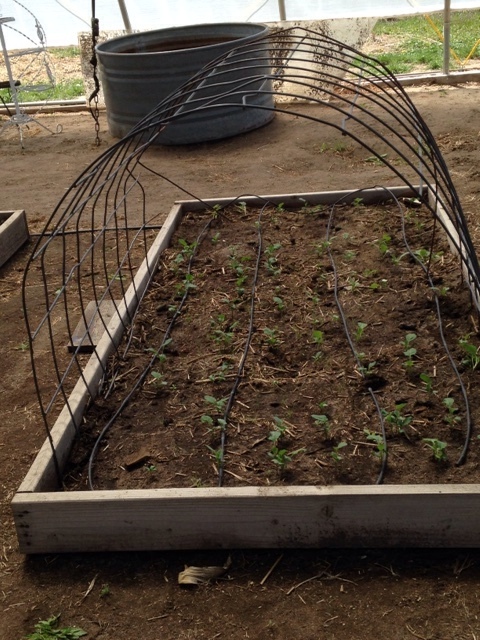 It's important to make your raised bed only as wide as you can reach across from each side. For me, my beds are four feet wide. I can easily reach two feet across to the middle – which is very important! One of the secrets to gardening in a raised bed is you never ever want to step in it! Soil compaction is a gardener's enemy! Have you ever heard of block planting? It's relatively new in the gardening world, but it's benefits are astounding. I remember, as a little girl, following my Dad around the garden with my bucket of seeds. One seed spaced perfectly from another in a long row. Thirty feet of beets, fifty feet of beans. A nice walkway in between each row. A beautiful garden – brings back great memories!! But even better are the results you can get with block planting. Take carrots, for example. By planting a carrot seed every three inches, every direction, you not only increase your yield up to five-fold, but the foliage will block out the sunlight to the weed seed in your soil. Without sun, your weeds cannot germinate! We are all for less weeding – for sure! 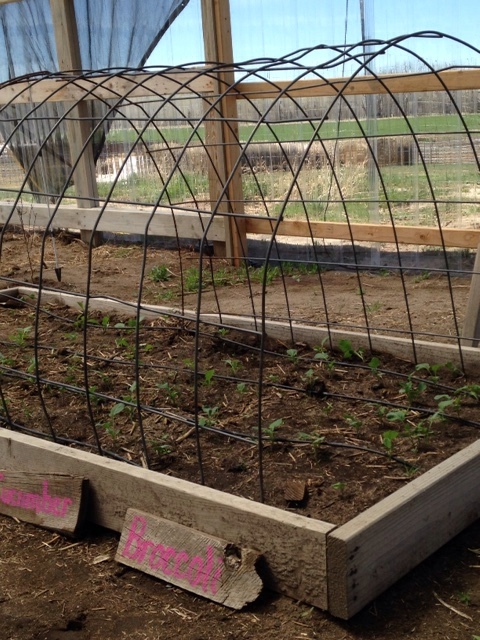 Here are a few examples of how your raised beds will look during the growing season. 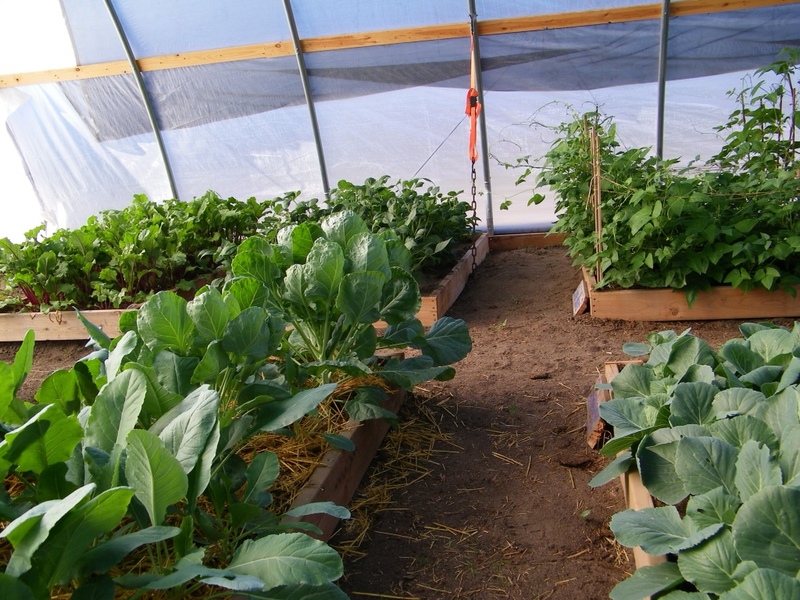 As you can see, I have been able to pack a lot of beautiful vegetables into my 4' x 8' raised bed. 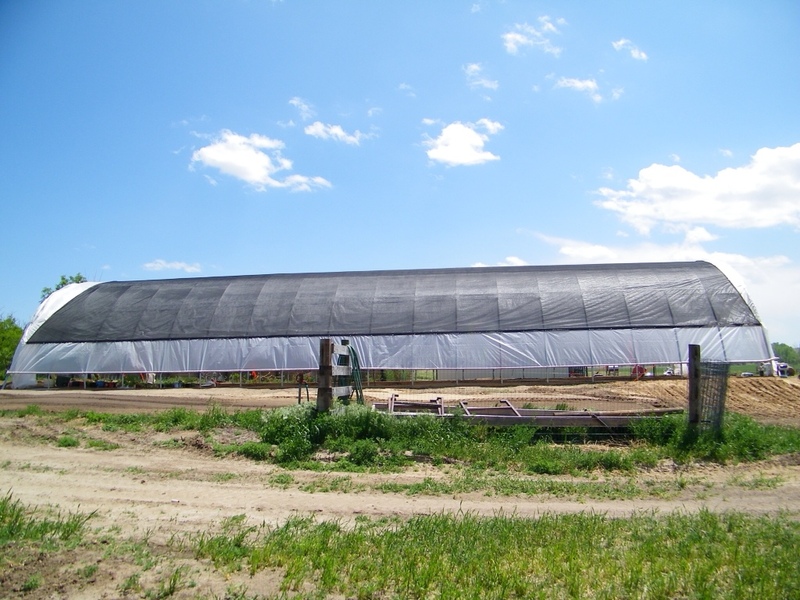 It is easy to reach into, I have installed four 1/4″ drip line with emitters every 6″ to put that moisture right where the plant can easily receive it. Mulch is necessary in most of my beds in the high tunnel. Colorado has very low humidity and great temperature fluctuations. The mulch allows us to keep that soil moist and cool in the hot sun and helps to shield the weed seeds from sunlight and germination. The taste quality of your crop is improved also. Think of it this way…have you ever been in your garden on a hot July day? Your corn plants had received an adequate watering that morning but now the foliage is drooping and they look thirsty? You are right! Not only has your water dissipated in the sun or wind, but the plant's taste is affected with the stress. A three inch layer of mulch would have helped protect your corn from the loss of the moisture, shield the weed seeds from germination, and make your crop taste better. Bingo!! Compare the taste of your home-grown tomatoes to any store-bought one! There is none! At KDL Ranch, located in the high plains of Colorado, we enjoy a simple, wholesome life raising grass fed/grass finished beef and fresh fruits and vegetables.